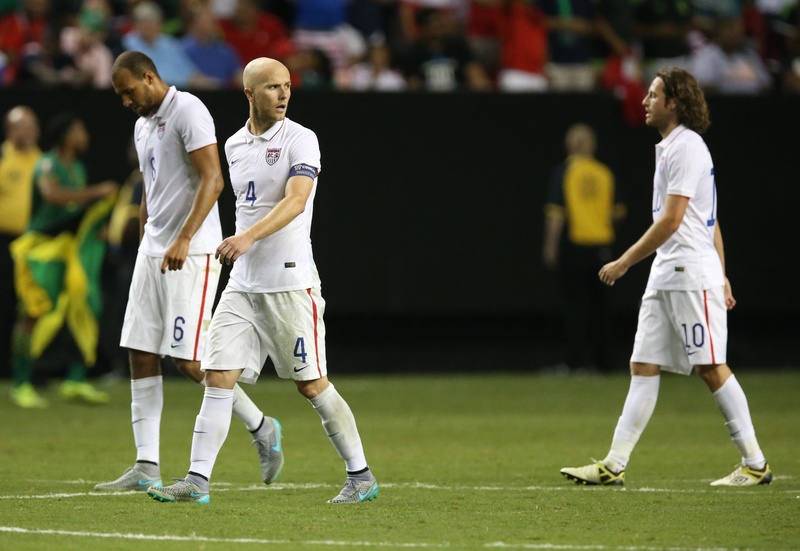 For years, the United States has striven to become a world power in soccer. Even as a majority of the country failed to acknowledge the sport, the die-hards in this country looked forward to the day when America’s passion for winning, combined with a population that seemed to populate every sport successfully, would lead to us competing with the likes of Brazil, Italy, and Germany. Now, after a disastrous Gold Cup, accusations of financial impropriety from leadership in the FIFA scandal, and a domestic league that has a number of recognizable players but fails on the international level, U.S. soccer may have achieved its goal of matching a world power. That world power, however, may be England, which at one time may have been a compliment but now is a slight. For a long time American soccer fans have been overrating the “next” stud talent that would lead the country to dominance, but that obsession has shifted to current players. Clint Dempsey and Michael Bradley can do no wrong and it is a crime that more international soccer pundits do not recognize how awesome they are. Just like the long litany of English players that were supposed to lead their club to World Cup glory, the US has a similar issue exceptAmericans do not tend to turn as quickly on these players when they don’t succeed; we hold on just a little too long. The US soccer media and public — just like the English journalists and fans — love to overhype young players that could be the next big thing, but never reach their pinnacle. Two examples are Freddy Adu and David Bentley. Both national teams have some legitimate stars in their starting XI and areas of strength. However, when you move beyond the starters, the depth of both countries’ national teams are lacking compared to the world powers. Injuries, suspensions, and poor play lead to a drop-off in production that exposes an overall talent pool that pales in comparison to Germany, Spain, and Italy. Yet don’t mention that to either fanbase. Is MLS improving? Yes, but failing to win a CONCACAF Champions League title is pretty telling where the league ranks compared to Mexico. Just as English fans cannot fathom the Bundesliga (or even La Liga) being better leagues in terms of players and style of play, American soccer fans try to compare MLS against the top European leagues and not those within their own hemisphere, where the rankings would still be a disappointment. The reason why the women’s national team is better is because it can draw in top american athletes. The same can’t be said of the men’s side yet. For pure athleticism, it can easily stand toe to toe with basketball and track at all levels. The men’s side have yet to tap into the athletes that would rather play american football and/or basketball. When that starts to happen then will see something. Another glaring problem is that many overlook is that a lot of the major college conferences do not sponsor men’s association football. That’s important because for all the talk of academies, without the college level game growth, the system producing future stars has hit a limit. Ah, the old “pure athleticism” smokescreen. Teams with smaller, stronger, and weaker players can still run rings around teams full of human thoroughbreds because they actually know how to play the game. To wit, Barca have won damn near every trophy in sight during the last decade or so based largely on that very paradigm. It’s not about finding bigger, faster, stronger players. Let’s allow the soccer culture to develop and take hold first. If another “analyst” makes the comment that “Man, if Le Bron was a soccer player…” Cause Messi, Xabi, Iniesta, Kruyff, Maradona are all great “athletes”. Football is not a sport that is determined by athleticism alone. And both England and the US have way too many “athletes” in their ranks-they kick, and run, and huff, and puff, and have zero talent for the game. My dad once said, “the rabbit can run fast as well, but he can’t play football”. So true! Yes, speed is important in football, but skill is a lot more important. The US national team (starters and those who are on the fringes), is simply devoid of talent-these guys can’t control and pass the ball well, they can’t beat an opponent one-on-one. What do you expect then? The most important part of the denialism that is totally there is the status of the league. The MLS is second best in this Confederation and this confederation struggles for third best in the world. South America and Europe play in a league CONCACAF can’t even hope to aspire to. Most of these 10 points apply to the national teams of a lot of countries. I cannot disagree more. The English Premier League has some of the best teams in the world. Anyone fears facing them. And their play style is the most entertaining in the world. I agree with the quote because english fans couldn’t imagine the prem being out of europe the early knockout stages. People are saying that it was just a one season flop, but maybe other leagues are catching up with England. English clubs have done poorly in European competitions in recent years. Since 2010, Chelsea is the only PL club to make even a European semifinal (two total). Bundesliga teams have made 6 or 7 in that period. Top clubs don’t fear playing them anymore because they know they will be good but not quite good enough. They believe their own hype. Brian – Keep this in mind: European competitions have homegrown requirements that EPL doesn’t. So, that’s not nearly as direct a comparison of the leagues as so many treat it. Why do you think Brits are so damn expensive on the transfer market in England? Adding international limits to domestic rosters would probably help EPL perform better in continental competitions, but I don’t know that they’d be able to keep their TV market value during the conversion. I completely disagree about the USWNT not having respect from the fans. Did you not watch the World Cup in Canada? USA fans took over every stadium. It’s silly to compare the national team to the domestic league attendance. The women’s national team has always been extremely popular. You’re pulling teeth trying to compare England to the USA. USA lost one penalty shootout and now they are falling to the likes of England? Hardly. USA has actually won a penalty shootout in a competition unlike England. This seems like a complete stretch to me. How many people watched the Algarve Cup just months before the World Cup? Hell, how many people even know what the Algarve Cup is? How is it a stretch. The USA women’s team is extremely popular during the world cup. Even friendlies sell out huge stadiums here on a consistent basis. How could anyone watch the Algarve Cup when it wasn’t broadcast on TV?